The person we interviewed was Maddie's mom, Claudia. She played an active role in the Women's Movement and feels very strongly about it. She had many experiences in the movement and made it a part of her everyday life. The interview took place on March 30, 2013 in Maddie and Claudia's home. 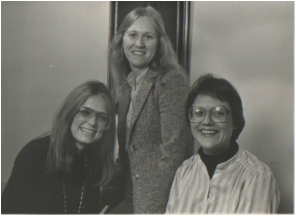 The image to the left is Claudia (middle) with Gloria Steinem (left) and Claudia's friend Mary (right). 1. What was the most powerful speech you heard during the movement and why? Shirley Chisholm- She is a black representative from New York, and she was running for president in 1972. This was the first time a women was seriously running for the democratic nomination. She was born to parents who were from the Caribbean and they lived in New York as a very poor family, while both parents had to work more than one job to support the family. To paraphrase what she said, "The worst thing you can do is engage in self pity. Forget self pity. If you go through life feeling sorry for yourself, you're not going to get ahead. So stop the self pity. I grew up with hardship; life is hard, get over it, and reach for your dream." I went to the speech, it was on the news, and my mom saw me on the news with her. 2. Who is your favorite activist and why? Gloria Steinem, because she seemed to have a far range of ideas, and feminism was her whole life. She started Ms. Magazine, and devoted her whole life to promoting equal rights for women. She did it with a lot of grace and humor, and was very instrumental. She was a great leader. 3. Why did you decide to become involed in the Women's Rights Movement? I think the first thing your generation needs to understand is what it was like to grow up as a woman back then. I was born in 1952 and graduated high school in 1970s, so my childhood was the 50s and 60s. That was the generation of women that Betty Friedan especially talked about in her book The Feminine Mystique, the mothers of that generation. Growing up as a girl, you knew that you had three career choices: you'd either be a teacher, a nurse, or a secretary. You also knew that your goal was to get married, and as soon as you got married you would quit your job, and you would be totally dependent on your husband for financial support. So, who you chose as your husband was important because your welfare was depended on how much money he earned. I remember when I was in the sixth grade we had an assignment and we were supposed to write about what we wanted to be when we grew up. Out of the three choices in my mind, I chose secretary. My mother had been a secretary, and when she got married she quit her job, and never worked again outside the home, so I thought that's what I would write. I wrote I would become a secretary, and when I get married I will be a mother. The teacher wrote: "Good, we need good mothers." My half sister was the valedictorian of her high school, got a full scholarship to an all women's college, became a teacher, taught for one year, got married to a dentist, quit her job, had her first baby at the age of 25, her seventh at the age of 40. She became very depressed at the age of 40, after her 6th boy was born. She had at least three psychiatric hospitalizations, and tried to overdose one day. She didn't succeed, but had severe depression for twenty years and treated it with anti-depressants. I think of her when I think of Betty Friedan when she talked about those women. Was she trapped? She grew up in a household raising six men. I think of her when I think of the Feminine Mystique. She was trapped in the role, and that was supposed to make her happy. After Friedan's book, that's when women started to realize they shouldn't live that way and that they didn't want to live that way. Women were very restless and wanted more. Many women came forward and said they didn't want to live like that even more. In 1964, Congress passed the Equal Pay Act during the Civil Rights Movement, which stated equal pay for equal work. That was mostly for blacks vs whites. They then added women because they thought nobody would support the idea so it wouldn't pass, but it ended up passing. When I was looking for a job, the help wanted ads were "Help Wanted Men" and "Help Wanted Women." Now since the Equal Pay Act passed, they couldn't do that anymore. When I graduated for high school, I prepared to go to be a secretary, planning not to go to college. I asked "Do you think a women really needs to go to college these days?" They responded, "No, why go to college when you're just going to get married and quit your job?" I thought I was going to do that, but that didn't happen. I stayed in the work force my whole life. The title "Ms." started in the early 70s as a title because women didn't want to be known on the basis of were they married or not, being called "Miss" or "Mrs." I got involved because politically things were changing, and I wanted to be a part of the change. I got involved politically, with my labor union, I marched for women's rights, for the Equal Rights Amendment, because I wanted to be a part of the change. 4. How did the movement affect your everyday life? When I was employed as a secretary, I was the secretary to the executive director of the labor relations board in Minnesota. He was a man. He quit, and the board members said "Look you've been his secretary, you know everything about his job, so we want to hire you for his job." So I took his job in 1975. But the board didn't set my salary, another boss did. I went to that boss and said "I just took Frank's job, so I should get paid what Frank got paid." He looked at me and he said "Claudia, you're a well paid girl. Frank is married and has a wife and two kids. You don't need Frank's salary." So he refused to pay me Frank's salary. So I appealed that, it took 18 months to fight through the system, and I finally ended up getting Frank's salary, which was about another five thousand dollars a year. Also, my relationships, like when I got married, I decided to keep my name. I thought why should I take his name, I wanted to keep mine. Before then, people didn't have a choice. I did, and I took advantage of the fact that I had a choice. 5. If you could go back in time to the movement, would you do anything differently? No I wouldn't but I wish it was still more active today. I wish people still worked for feminism today. I think we've sort of slid back a little. 6. Have you ever met an activist? What did you most admire about them? I've met Shirley Chisholm, Gloria Steinem, and have heard many other people speak. I admire Steinem making it her whole life's work, and I don't think the movement would be half of what it was without her. Chisholm is an inspirationally personally and politically with how far she got. 7. What was your favorite memory from the movement? In 1974, I went to the founding convention in Chicago of the Coalition of Labor Union Women (CLUW). I was active in my union in Minnesota, and there were 3,200 delegates in attendance. I was 21 years old, sitting in a room full of over 3,000 women activists from all over the country. Steinem was in one of my workshops, and as I looked around, I was in awe that women could be leaders. Many of them were different races, and I was so overwhelmed that women, black women, migrant workers, and that women could do this; women could be leaders. Women could be in positions of power, women could lead other women. I went home and became a founder of the Twin Cities Chapter of the CLUW, and I was the first treasurer. It was an absolute eye opener that women could do this, because I grew up thinking that women could do anything. It was amazing that there were choices and opportunities that I just had no idea about before. 8. What do you think was the most drastic change/ result from the movement? Gloria Steinem said "The personal is the political," meaning that all this change happening in the political, social, work world, is going to affect you in your personal life. They're tied together. The biggest thing for me is that my personal life was totally changed. The men I chose to date had to be open-minded about it. At first I thought I wouldn't marry, but if I were to marry I had to find someone to accept the ideals I had. I wasn't going to get married and stay home and do the house work, and be second to my husband. That happened for women around the nation. 9. What do you think still need to be changed/improved for women today? I wish there was the same day-to-day awareness that women are seen as the second class. Women are still seen as "the other" so I wish there was still more awareness of it. 10. Do you still carry the beliefs you had during the movement with you today? 11. Is there anything else you want to share? I went to law school. It wouldn't have even occurred to me that law school would even be a path for me if the movement didn't happen. Half of my class was women. That's how fast the change happened. That would never have happened before the movement. I don't know if your generation stands up for themselves in the dating world, and I wish girls stood up for themselves more. I don't like how some girls dress because the self-respect is not there. Girls still seem to do whatever boys want. 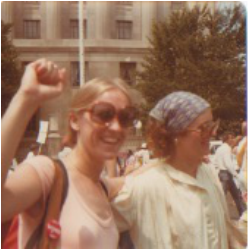 Above is a photo of Claudia (left) with her friend Ann (right) at the Equal Rights Amendment March on Washington D.C., in 1978. Our group was amazed at how much involvemend Claudia had in the women's movement. We thought it was really cool that she got to meet Gloria Steinem, who had such a large impact on the changes that took place in the 1960s and 1970s. It really hit home to hear someone that we know personally discuss how different women's rights were just forty years ago. We are impressed that Claudia is still so adiment about her views today, and we truly admire the actions that she takes based on those views. We were very impressed by how much Claudia was involved in the movement. We didn't realize how much it affected everyone's lives back then, and still now. Her daily life was affected, and it is obvious, with seeing her personality now, how determined of a person is and how she will always fight for what she thinks is right. We are really glad that we interviewed her!